Our first doll meeting of 2018 introduced our new coordinator, Beverly. Members brought in their “Maggie goes Shopping” dolls (pattern by e p bailey) and members revealed the round robin dolls! Another successful meeting! Mary had provided some of her lovely vintage fabric for the members to use in costuming her doll. Charlotte started her doll off with a green hairdo! 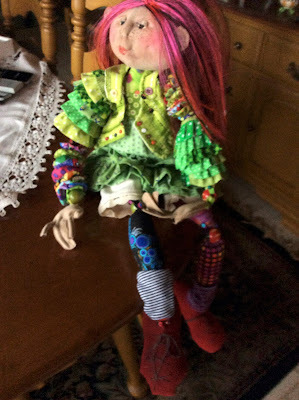 Maureen's doll became a cowgirl who went home with Michele to add her boots. Sharon got her doll back and she turned out with a "prairie" feel. Michele got her doll back and she is dressed in a fancy negligee outfit! Maida got her black and white gal back. Gail got a lovely "island" girl back ready for a gala event. Beverly got her lovely gal back with a hand crocheted dress but missing her knickers, oh my! They all turned out with different clothing and personalities even though they started life with the same doll body and same doll head! What fun. Now for the "Maggie goes Shopping dolls": This doll is from an elinor peace bailey pattern and is great fun to make as you get to break into your stash of fabrics to make yo-yos for the arms and legs and all the different layers of clothing. Members worked on the dolls during our fall retreat at Heritage Acres. Cathy made her gal a lovely, comfy arm chair for Maggie to lounge on! Thanks again to all members and see you in February when the "Red and White" challenge dolls will be revealed just in time for Valentine's Day!